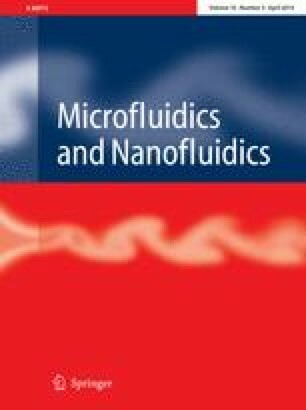 This paper describes the optical separation of microdroplets according to their refractive indices. The behavior of the droplets was characterized in terms of the optical force and the hydrodynamic effects present upon illumination of the droplets in a direction normal to the flow direction in a rectangular microfluidic channel. The optical forces acting on the droplets and the resultant droplet trajectories were analyzed and compared with the numerically predicted values. The relationship between the drag force and optical force was examined to understand the system performance properties in the context of screening applications involving the removal of unwanted droplets. Two species of droplets were compared for their photophoretic displacements by varying the illumination intensity. Because the optical forces exerted on the droplets were functions of the refractive indices and sizes of the droplets, a variety of chemical species could be separated simultaneously. The online version of this article (doi: 10.1007/s10404-013-1263-0) contains supplementary material, which is available to authorized users. This work was supported by the Creative Research Initiatives program (No. 2013-003364) of the National Research Foundation of Korea (MSIP).